Ou se loger pendant le weekend Kaz’Out ? Comme chaque année, le Kaz’Out se déroulera le 1er weekend de novembre. Le festival installé dans le nord de l’ile, propose un weekend complet autour de la musique. Quoi de mieux que de se mettre dans l’ambiance du festival dès le jeudi 1er novembre avec les OFF Kaz’Out. Au programme, concert, showcases, conférence et ateliers autour de la musique. Where can you stay for the Kaz’Out weekend ? Like every year, Kaz’Out takes place the first weekend of November. The festival settled in the north of the island, offers a complete weekend around music. 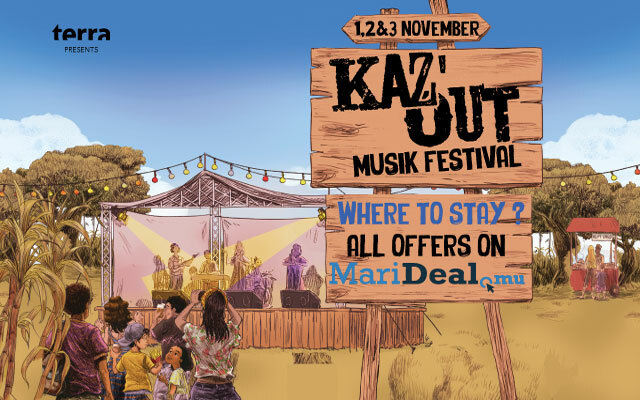 Get in the festival mood as from Thursday the 1st with the OFF Kaz’Out: There will be concert, showcases, conferences and workshops.